BUNN coffee makers are more like the Apple iPhone of c﻿offee makers. They do look like they cost a pretty penny upfront. But when compared to the existing models on the market, the years of service and smooth functionality of BUNN brewers make them not as pricey as they look. In fact, don’t be surprised if you happen to meet customers who pledge their loyalty to BUNN. Just the taste of one model is enough to leave them experience the significance in taste and quality. So if you’re like me, who’s petty serious about your cup of joe, then the first brand I’d recommend you consider is BUNN. My years of experience in the industry, and the passion for coffee will stand as witnesses to my recommendations. Since you’re here, I think it’s only fair to assume you’re interested in BUNN, and my review might help you get started. I’ve put together a list of the best Bunn coffee makers - they excel at what they’re being made for, and will surpass your expectations. Keep the ball rolling and scroll down to discover what they are! Here's a quick comparison chart that'll help you choose the one that fits your needs. ​Let's delve into the reviews of bunn coffee makers one by one. When BUNN advertised NHS Velocity as the fastest 10-cup home coffee brewer on the market, my curiosity was piqued. Just how fast could it be? And I found some interesting answers on my search. Bunn has incorporated a stainless steel reservoir into this model. It gets heated so fast like a hot plate and that’s what helps to brew a 10-cup carafe in just 3 minutes! It also keeps hot water ready to brew from the time you switch it on – helping you to cut down a significant amount of prep time. It’s advertised to brew a minimum of 4 cups at a time, so it’s definitely a family model. But you can brew a single cup as well, because it brews only the amount of water you fill the tank with. What’s special, however, is that the coffee taste doesn’t change. It’s consistent over the cups you brew – let it be single, 4 or 10. The carafe of this model is another thing worth noting. BUNN has managed to reconsider the design of their carafes and seal off all leaking spots. So should you consider buying the NHS Velocity, you’ll no longer have to deal with a dripping problem. On the downside, however, the coffee maker tends to fail in the hands of non-BUNN filters. They don’t have the extra height and quality needed to handle the pressure and speed at which the brewer operates. So as the only way to avoid grounds in the coffee and the overflowing problem, make sure to add a BUNN filter to your cart. NHS Velocity isn’t a brewer with many bells and whistles, but still a favourite among coffee lovers due to its speed. It’s a life saver in a time crunch and no other brewer can brew as fast as it can – not to mention without hindering coffee quality. It lacks nothing in terms of performance and durability as well, making it definitely worth a buy. MCU is one of BUNN’s best multi-functional coffee brewers made to serve one cup at a time. It doesn’t boast many bells and whistles, but it’s put together and advertised to surpass your expectations. Not only can the MCU brew coffee from K-cups and coffee grounds, but also tea. For brewing tea, it accepts tea bags, pods and your own loose tea. Better still, it’ll provide you with plain hot water as well. When you’re in the mood for a cup of hot chocolate, oatmeal or soup, all you need is to simply press the hot water button. If you’re a coffeeholic who prefers coffee to be piping hot, then the BUNN MCU won’t disappoint you. It serves coffee hot enough to burn your tongue if you weren’t careful. It comes with different settings for the coffee strength as well – which means that there’s a bit of a learning curve. But once you get a hang of it, it’d be worth the effort as you can have a flavoured cup to your liking. The brewer, however, has no water reservoir. While some find it inconvenient, I actually like the concept. Every time you want a cup fixed, you pour in water and that amount would be the amount of your cup. It’s easy to measure, and I use my favourite coffee mug to measure water. MCU is mostly an entry-level, single-server brewer. Though a machine, it puts you in charge of your own coffee or tea, allowing you to measure and set the strength to serve you better. The customer service is too good to be true as well – should you happen to buy it an encounter any unexpected failures. I hold nothing back in recommending it to those on the market for a single-serve brewer. Coffee can be an extremely time-consuming task during crunch times. If that’s the case, then BUNN BT Velocity should be the brewer to lie on your counter. It can brew a maximum of 10 cups, and takes only about 3 minutes to get there. It’s in fact one of BUNN’s fastest brewers and wouldn’t slow down over time. Not only is it capable of brewing coffee, but also providing plain hot water for a variety of beverages you’d be in the mood for. Better still, the speed of this brewer doesn’t compromise coffee quality. It has been incorporated with a unique sprayhead that extracts flavour evenly from the grounds, which makes coffee taste as good as it can ever be. The thermal carafe of BT Velocity is actually a game changer. It can keep piping hot coffee warm for about 2 hours – enabling you to brew in advance until next time. So you can use it instead of fretting over a hot plate to heat your coffee. If you consider buying this, do make sure you’ve enough space on your countertop because it’s quite beast of a machine. It measures at 7.5" W X 13" D X 15" H - taller than most brewers and truth be told, it doesn’t look fancy. I think the only thing BUNN manufacturers haven’t improved over the years is the looks. The quality is better than rival products, and may sustain daily abuse for at least a few years, but falls short in the beauty department. If speed and functionality are the key elements of your family brewer, then the BUNN BT Velocity is one of the best choices on the market. It may seem a little on the expensive side, but will prove you in no time that it’s worth every penny. BUNN has always held the reputation for producing the fastest brewers on the market – and so is the same with BX-D Velocity. Fast, however, doesn’t mean poor coffee strength. The water is run through the grounds at such speed that extraction of flavours is done extremely well. So I wasn’t surprised to find how good it tasted. The strength, heat and taste of coffee can’t get any better than this. Brewing a pot full of coffee for your family is no biggie for this brewer, because it’s proven to do it in less than 3 minutes. Though most parts are made up of plastic, be rest assured that it’d last way past your money’s worth. You’ll realize it in no time once you get to feel how sturdy it actually is. The pictures do BX-D Velocity no justice. The biggest selling point of BUNN BX-D Velocity is its high altitude setting. If you’re living a lot higher from the sea level, then you should definitely be opting for a brewer in this category. The high altitude setting actually helps to serve you coffee at the ideal temperature, knowing how fast it cools down at higher altitudes. On the downside, however, you ought to be careful with the fineness of the coffee grounds. BUNN filters, when used with finer grounds, tend to overflow due to the speed and force of the water. BX-D Velocity is one of BUNN’s efforts to cater the coffee needs of customers living in high altitude locations. It’s also the fastest brewer in this category. Apart from the hot plate, it comes with no other special features - but will live up to your expectations with its flavour, speed and longevity. BUNN GRB Velocity is the closest substitute to NHS Velocity – the only significant difference is observed in the way they’re designed. The GRB is much taller, and wider than the NHS. It clocks in at 39 x 22 x 37 cm, which is nearly 15 cm taller than the NHS. So if you’re running short of countertop space, then GRB is not the model you should be checking out. Just like the NHS, this one too, is super fast. It can brew a maximum of 10 cups in just under 3 minutes as it keeps a tank full of hot water always ready. The speed, however, doesn’t compromise coffee quality. It has a unique spray head to ensure even extraction of flavour from the grounds. But do make sure the grounds are not finely ground – the finer they are, higher the risk of overflowing. However, you need to buy only BUNN filters. Non-BUNN filters don’t even hold a candle to the quality of BUNN, neither can they handle the speed at which GRB operates. The other thing to usually watch out for is the carafe. But thanks to the remodelled design, it no longer drips. So you can now pour coffee easily and effortlessly. The only notable shortcoming in this model, like most BUNN models is the lack of aesthetics. Though the best in terms of functionality, it doesn’t boast a classic look. This serves to be a disappointment for many. If all you’ve ever wanted is a hassle-free, super-fast and excellent cup of coffee for many years to come, then GRB Velocity would fit the bill. It doesn’t boast many features, neither does it look fancy, but its functionality beats everything to ashes. Tired of burnt office coffee or have you had enough of waiting in a coffee queue that may never seem to end? Then you should certainly have a look at the BUNN VPR-2GD Commercial Brewer. Made to sustain heavy use with an all-metal interior, this brewer is one of the favourites of all time. It does come with a price tag that’s on the high side. But be rest assured that it’ll serve you long enough to give the best bang for your buck. It can brew up to 3.8 gallons of coffee every hour, or in other words, a full pot of coffee every 3 minutes. The speed, as always, is a huge bonus – enabling you to serve multiple employees back to back. It has two burners, and serves coffee at the ideal temperature. The coffee taste is excellent as well, and will surely uplift the mood and productivity of your employees. On the downside, however, the machine is quite noisy. It doesn’t come as a surprise to me given how fast the water is heated and passed through the grounds. But the chances are, the noisy process would be over by the time you start noticing it. Lack of features is another thing worth noting before you place a buy. For the price, it’s only reasonable to expect at least a timer, but this brewer doesn’t come with one. If high quality is an absolute must, and if you’ve many coffee enthusiasts in your workplace, then I can’t think of a better brewer than the BUNN VPR-2GD Commercial Brewer. It doesn’t boast many features, but the manufacturers have made it with such a high quality that you can be sure of getting your money’s worth. 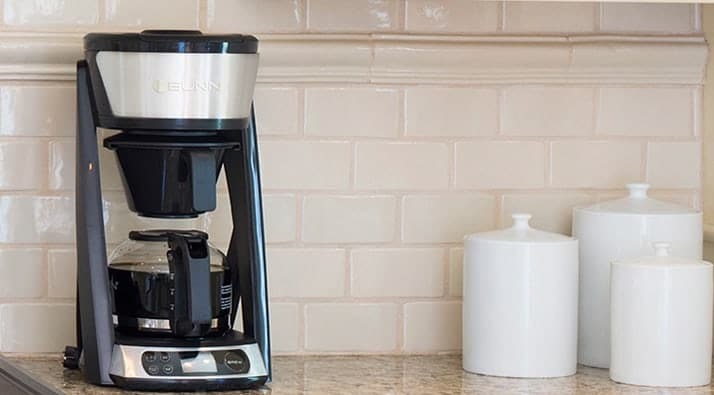 Speed Brew is one of BUNN’s latest model, with better tasting coffee. Some even compare it with the coffee from famous coffee shops, claiming that there really is no difference. This is mainly because the Speed Brew features a distinct sprayhead that allows water to be in contact with the grounds longer than the previous models. As a result, more flavours of coffee are believed to be extracted. It needs only 4 minutes (a minute longer than Velocity) to brew a pot full of coffee. Just like the previous models, this is achieved through a tank that keeps water hot and ready. Speed Brew, however, has an on/off switch to shut off the heating system if you want to conserve energy. As if the coffee brewed isn’t hot enough, a warmer plate is incorporated into this machine. It doesn’t feature an auto shut-off system, but does come with a separate on/off switch for your convenience. Design wise, I accept that I tend to like the Speed Brew the most. It is curvier, and has a feminine touch lacked by the previous BUNN models. This design also has a better impact on how the coffee drips down to the pot. The glass carafe, on the other hand, is as same as the ones found in all BUNN models. They’re redesigned to avoid spillage and messy kitchens. Speed Brew is a machine designed to be loved, inside out. It does take up a considerate amount of countertop space, but matters not because it looks prettier than other units. It also takes about a minute longer to brew, only to serve you better tasting coffee at the convenience of your home. BUNN has always been my favourite brand because it’s the only brand that disappointed me the least. I’m certain that most customers would agree with me, and it’s the closest you’ll get to the quality from your grandparent’s time. I believe you’ve already found which one would serve your needs, and if that’s the case, Happy Brewing! Thank you so much for providing this information. I have found your reviews to be most helpful. I want a BUNN…my parents have one and it makes amazing coffee, but with all the models on the market i wasnt sure what to go with. You helped me make my decision! Thanks so much! We just purchased a new BUNN Speed Brew 10-Cup Home Coffee Brewer to replace our old Bunn BX. I’m not happy with the new. The switch to activate the brewing of water in the lid seems to be cheaper than the BX’s, with the mechanical switch. Thinking seriously of returning this thing and getting the older style. We had the BX for more than ten years and it was always a great coffee brewer so far not happy with the Bunn Speed Brew! I have used a Bunn for many many years, that being said, I’ve have returned 3 of them for leaking problems. I really prefer not to clean up water from the leaking all over the cabinet. Not sure why the quality has gone down but I will be switching to another coffee maker. The latest I received as a gift for Christmas and already have a leaking issue….. Not a happy Bunn user any longer! Are you using Bunn filters? I have noticed a few times, coffee running down our counter onto the floor. After I did some investigation I noticed you need to center the coffee pot onto the burner. If someone puts the pot on and it is towards the back of the burner close to ,or touching the plastic reservoir ,coffee will pour out over the top of the pot. It would work better if there were several holes in the lid , or have the indentation larger, preferably both. We never had this problem with our first one, we had for years. I noticed when using this new one the pouring lid had changed. Not for the better though. Get a reusable filter, they work well in our Bunn. I received the Bunn pour-omatic as a gift to replace my 2nd one which failed as did the 1st one did.. This new one has the same appearance, is white, but has a “through hole” ….which, as you pour into the lidded entry, it immediately pours out through the filter with no delay as my 1st.ones did.?? I’m not sure why they eliminated the mechanical delay lid…which prevented the newly poured water from entering until the lid was closed. I now have to hold my finger on the exit hole of the filter holder so that I have time to put the carafe under it. Ouch! it’s hot . should a second carafe have been included with this package, or does the user have to purchase the second carafe…was this a mfg. oversight? disappointed bunn lover….with a slightly burned finger tip.